94 starters and 50 classified finishers. 1936 & 1937 Giro winner Gino Bartali was ordered by the Italian government to miss the Giro to properly prepare for the Tour de France, which he won. The only rider who could have challenged Bartali, Giovanni Valetti, took the lead in the hilly ninth stage. From there he continually increased his lead until he was nearly nine minutes ahead of second-place Ezio Cecchi when the race ended. There were several days with split stages. Some accounts call them a & b, thus giving 1938 18 stages. Others (and this is the more common Italian practice) give each stage a unique number, making 1938 have 21 stages. I have followed that second practice with the alternative stage numbers also noted. 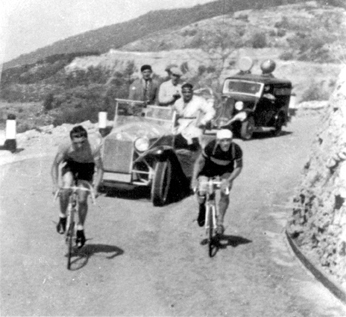 Looking to enhance Italian prestige worldwide, the Italian government ordered Bartali to skip the Giro in order to properly prepare for the Tour de France, so Bartali as well as his Legnano squad had to take a pass on the Giro in 1938. In that 1938 Tour, Bartali, then the Italian Road Champion, earned a page in cycling history with his dramatic solo victory in the fourteenth stage with its three major alpine passes. Girardengo directed Bartali and the Italian team as they clubbed their Tour competition into submission with a final eighteen-minute gap over second-place Félicien Vervaecke. Thus the Giro was deprived of the most exciting stage racer in the world as well as a proper rematch between Valetti and Bartali. Because the entire Legnano team was absent, the race was also without Bini, Mollo and Bergamaschi. Trying to put a little lipstick on the pig, La Gazzetta promoted the 1938 Giro as a race of youth. In 1937, most of the independents had been gathered in “Clubs” but 31 had remained completely on their own. In 1938 all riders were either on sponsored teams or grouped by the organizers into clubs. There remained a diminished foreign contingent and again Amberg was far and away the best of this group. The 1938 Giro was an Italian race that was Valetti’s to lose. He and Bartali had been so far ahead of the competition that the 1937 Giro was a simply a race between these two men. The only time trialing in the 1938 edition was a 20-kilometer hill-climb at Terminillo. The team time trial, which dissatisfied a lot of fans, was dropped for now. Journeyman pro Marco Cimatti took the year’s first Pink Jersey by winning a big sprint into Turin. The next day a break of five capable riders—Vicini, Del Cancia, Canavesi, Ruggero Balli and Adriano Vignoli—pulled 3 minutes 39 seconds clear of the pack. Vicini won the sprint along with the honor of wearing the maglia rosa. His breakaway companions were scored with the same time, but behind him in the General Classification on the basis of points. The points give and the points take away. Del Cancia finished in front of Vicini at the end of stage three and now he was the leader. Valetti won the time trial, moving him up from eighth to fifth place, but Del Cancia had done well enough not only to keep his lead, but also to put two minutes between himself and Canavesi. While Del Cancia had a clear lead, Valetti the bloodhound had the scent. 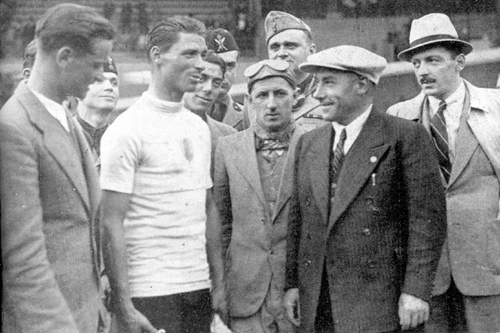 Valetti pounced in the stage that so often had made a difference in the Giri of the 1920s and ’30s, the race from Naples across the Apennines to the Adriatic side of the peninsula. He broke away with Giordano Cottur, a powerful rider just beginning a pro career that would run right into the Bartali and Fausto Coppi buzz-saw. He earned the nickname the “Eternal Third” because of his ability to beat everyone but those two. Cottur and Valetti used the second half of the 221-kilometer stage eleven well. Their break of 120 kilometers gave Cottur his first Giro stage win and Valetti a time gain of 4 minutes 46 seconds. That was more than enough to give him the lead and put Del Cancia in second, 1 minute 37 seconds back. By the time the race had arrived at Belluno before the seventeenth stage’s trip through the Dolomites, Valetti still had the lead, though he hadn’t been able to nurture it into anything that might allow even the slightest relaxation. The Dolomite stage again went over the Rolle, and Canavesi teammate Bernardo Rogora was first over the top. The next major ascent was to Pian delle Fugazze. 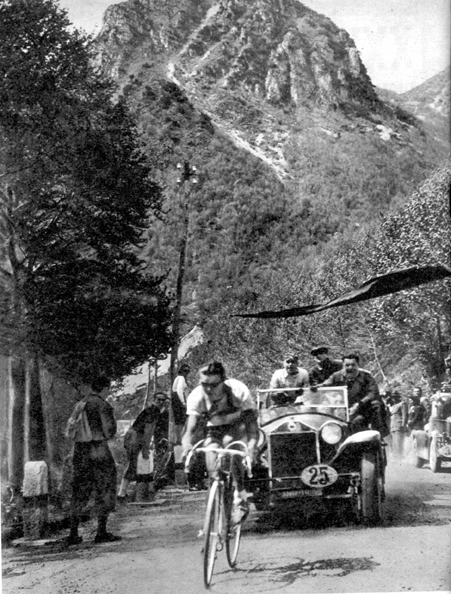 Valetti was in his element in the mountains and was first to crest the pass. He finished alone at Recoaro Terme, 1 minute 46 seconds ahead of Cecchi while Canavesi lost six minutes. For Del Cancia the stage was his downfall as his 21-minute time loss put the race out of reach for the year. Cecchi was the new second place, 3 minutes 26 seconds behind leader Valetti. Valetti held steady as the race went back to Milan. With Bartali gone, there was really no one who could challenge the taciturn man from Piedmont. By the standards of the time, this was a blisteringly fast Giro with an average speed of 32.272 kilometers per hour, and, so far in our story, the fastest Giro ever. Almost immediately after winning the Giro, Valetti headed north and won the Tour of Switzerland, beating Arsène Mersch by almost thirteen minutes.